A guide for volunteer basketball coaches — especially those coaching girls in 4th – 8th grades — provides an easy to follow approach to coaching and managing your team. The “Never Forget They’re Kids” philosophy places an emphasis on learning, having fun and creating memorable experiences for players. 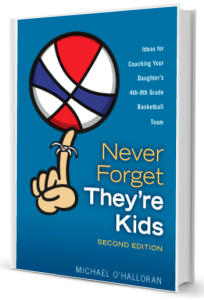 The book covers important fundamental basketball topics like defensive and offensive skills, rebounding know-how, shooting technique (including the 2 most common shooting flaws for this age group and how to address them), your coaching approach on the bench and practice preparation. · 30 ideas to keep kids interested in basketball — From a “Rock n’ Roll” practice to a “Slam Dunk Photo Session,” you’ll learn some proven concepts to keep your players engaged during the season. Kids will look forward to practices as much as games. · A detailed explanation of how to handle your first player meeting and your first parent meeting. A sample introductory email to parents is included. · An inexpensive and simple way to create a team website and how to use your camcorder to make the most of the basketball season. • Be positive. Kids accomplish the most when they feel confident. • Breakdown complicated activities into bite-size chunks. • Encourage a risk-taking environment. The effort needs to be rewarded even if the result is lacking. • Empower players to think on their own.